Blackmagic Design’s ATEM Television Studio HD improves on the its previous iterations by including 4 SDI and 4 HDMI inputs (8 total sources) that support formats up to 1080p60. 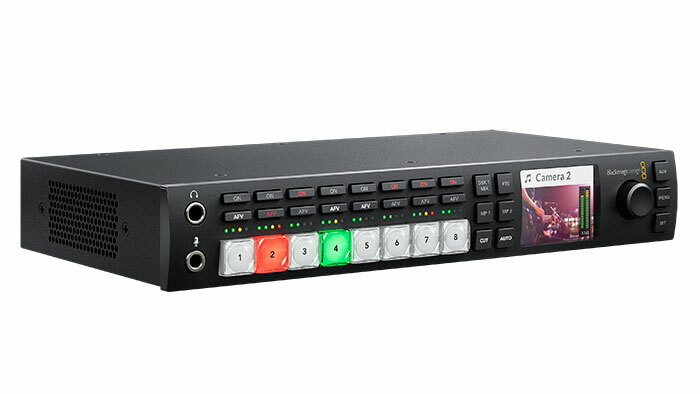 It hosts a bevy of features including: multi view, talkback, DVE, an audio mixer, flash media players, and more! Live Production Switching. Switch between multiple sources in real time with broadcast quality transitions, graphics, and effects… and do it all with the press of a button! The ATEM Television Studio HD features clean professional switching and can be used as a front end controller to produce streaming high-quality video that is broadcast-ready – whether through traditional broadcast or through online services such as YouTube or Twitch.tv. The built-in LCD screen lets you adjust all switcher features via menus and can be used for: video monitoring, audio monitoring, aux control, and audio channel display. Built Strong. Compact and portable, the ATEM TV Studio HD measures in at 11.02″ long, 6.89″ deep, and 1.75″ tall. It’s small enough to use on the desktop or mounted in equipment racks. It’s all-in-one design includes a built in AC power supply, full front panel controls with input source buttons for switching, a built-in LCD screen, and a spin knob. Software or Hardware Control. The Blackmagic ATEM Television Studio HD can be controlled via its front panel or a free software control panel (for use in both Windows and Mac environments). Load graphics into the switcher for display or keying, control the built-in hardware audio mixer, control cameras, and more. Using compatible cameras, the software interface can also remotely adjust iris and focus, camera settings and color correction, all via SDI. Connections! Four 3G-SDI inputs. Four HDMI inputs. Reference input. Analog audio in. RS-422 PTZ control. Ethernet. The kicker? All video inputs have automatic frame re-synchronization. SDI Video Input 4 x 10-bit SD/HD switchable. 2 channel embedded audio. HDMI Video Input 4 x HDMI type A, 10-bit SD/HD switchable. 2 channel embedded audio. Reference Input Tri-Sync or Black Burst. SDI Program Output 5 x 10-bit SD/HD switchable. SDI Audio Output 2 Ch embedded into SDI output. 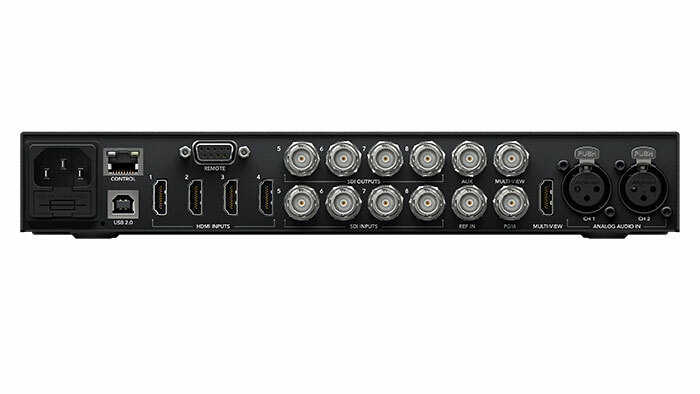 Outputs per Multi-View 1 x HD-SDI and 1 x HDMI. Control Panel Ethernet supports 10/100/1000 BaseT. Allows direct connection between panel and chassis, or via network. Also used for updating the software.